Memorial Day means the end of school and the start of summer vacation season. Each year, millions of Americans head out to the beach, a destination city, or a national park. We visit relatives and rediscover our roots by traveling to Africa, South America, or Central Europe. In total, we make more than 650 million long-distance summer trips. A splashy, 10-day stay at Disneyland or a three-week trip to Japan might be nice, but that is not the norm. Nine out of ten American families travel by car when they leave on vacation traveling, on average, just under 300 miles (one-way) away from home. As the Chevrolet ads used to say, “See the U.S.A.” Think about all of the places you’ve meant to visit close to home, but never got around to seeing. If you routinely go to visit family or friends, think about day trips you can take from your away-from-home base. Every state, and most cities and towns, have websites that will give you ideas of what to do on your stay. It’s easier than ever to estimate your travel expenses. Websites like Expedia and Travelocity, among others, can show you the average hotel rates, air ticket costs, even ground transportation costs. Doing a Yelp or Google search will give you a feel for what you might be spending on meals and entertainment. AAA offers insights into the price of gas in different locations. Be sure to include incidentals like road and bridge tolls, and souvenir shopping. You’ll also want to include any at-home costs, like boarding Fluffy or Fido. A budget only works if you stick to it. Technology can help here. Online and mobile banking can help you stay up to date on what you’re spending, make payments, and keep an eye on your bank balances. Try not to be too free with your credit or debit cards. Instead, think about loading the money you’ve budgeted for incidental expenses—Mickey Mouse ear for the kids, a margarita at sunset, extra sunscreen, for example—onto a prepaid debit card. That way, you’ll spend only what you budgeted. Experienced travelers know to ask a local for the best place in town to get a burger. Well, the internet has expanded the notion of “local.” Visit the website of the local newspaper; you might find out about the volunteer fire department’s annual pancake breakfast or the Founder’s Day picnic. You’re likely to get a good meal at a good price, and meet some real locals. Amazon Local Deals serves the same purpose. 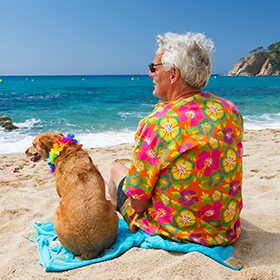 Following these four tips will help you enjoy a summer vacation without interrupting your regular retirement savings routine. That routine starts with having a self-directed IRA that gives you control over the assets you invest in, everything from real estate to precious metals. And because you have a vacation to plan, we make it easy to open an account in less than 10 minutes online.